5 Acid DJ-Tools all in 130 Bpm and 5 min. long! THIS IS AN REMIX COMPETITION! MAKE A TRACK WITH THE ACID TOOLS OR REMIX THEM AS YOU LIKE AND SEND YOUR MATERIAL TO INFO(at)SUPERSIX.DE! THE TRACKS WILL BE RELEASED ON SÄUREBAD RECORDS!!! THIS REMIX COMPETITION HAS NO END SO BE CREATIVE!!!! 01 – 5 min. Acid Warning Part . . . → Read More: 5 Acid DJ-Tools all in 130 Bpm and 5 min. long! Debut EP of the Canadian Dan Carew incl. some remixes of Fax, OCP, Humeka and Glander. Free equinox records V.A. "One Year & A Day – The 5inch Files"
(01) Vangel – Wake Up (02) Misanthrop – Commercialism (03) DJ Scientist feat. DJ Snatchatec. – Rewind & Refine (04) Aqua Luminus III. – Uplock The Poprock (05) Mnemotrauma – Shining (06) J. Baracuz – Yellow Cab (07) SmoKey131 – Got To Keep On Searchin’ (08) B-Ju – Soja Extra (09) Aqua Luminus . . . → Read More: Free equinox records V.A. "One Year & A Day – The 5inch Files"
Zum herunterladen auf das Cover oder hier klicken. Click on cover or here to download the magazine. After 5 years in Los Angeles, experimental filmmakers, Julian and Linnea Dahl, have returned to Vashon with their first feature film – “Camjackers” – a quirky comedy-drama in which class war, revenge and the race divide collide in a funny post-Reality hiphop mindtrip. This carefully improvised film follows the underclass Camjackers as they wreak their revenge on the middleclass Filmfakers using their own cameras against them. The film caricatures white cooption of black culture in the ironically simultaneous contexts of racial fear and the fetishization of black cool. Secondly, it explores indie-filmmaker-as-pop-icon with a knowing wink at media access, representation, and social control. Lastly, “Camjackers” is an actual experiment in genuine creative access in which two real groups of film artists were actually given the tools to realize their films-within-a-film, while also starring as characters within this feature film. The story takes shape in real time as the Camjackers edit various tapes on screen while we watch. Teaming up with LA Filmmakers Co-op (www.lafco.tv), a filmgroup described by Res magazine as “media merry pranksters on wheels”, Julian and Linnea sold their house, put out casting calls, and conjured the dream into actuality. Three and a half years later, the film is done and touring the festival circuit, recently winning Best Editing at Ann Arbor Film Festival and screening at Harlem International Film Festival. This is a chance to see the work of WildChild producers Julian and Linnea Dahl close up. Bust out underground conscious hip hop from the leading lights on the west coast – 2MEX, Orko Eloheim, Phoenix Orion, Honz & Halos and more. Blessed by the legendary folks at Project Blowed – the longest running hip hop label on the west coast. Can’t make a film? Just steal one! Class war, revenge and the race divide collide in this funny post-Reality hiphop mindtrip. 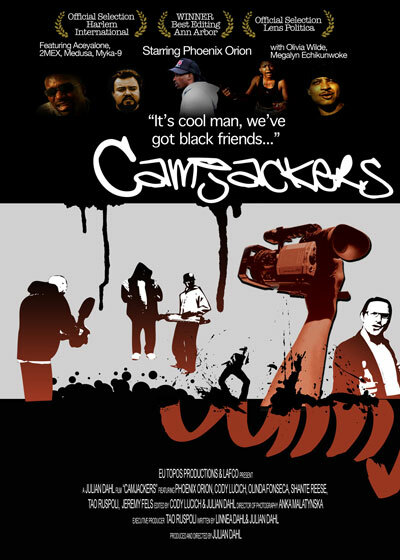 CAMJACKERS is a funny, LA street story about 2 rich, scared filmfakers in the hood and the 3 guys who ‘borrow’ their equipment, make a film, get ripped off, and seek revenge. Two rich, clueless filmschool grads (“the Filmfakers”) are shooting a “ghetto” interpretation of an ancient Greek play on the mean streets of Los Angeles. Their equipment is ‘borrowed’ by three street youths (“the Camjackers”), who shoot a compelling documentary on underground hiphop. The Filmfakers rip off the Camjackers’ film and rise to fame and fortune. The Camjackers see their stolen work on TV and seek revenge. Camjackers is an experiment in creative access in which two real groups of film artists were given the tools to realize their films-within-a-film, while also starring as characters within this feature film. The story takes shape in real time as the Camjackers play rushes and edit various tapes on screen while we watch. The rawness of the film, and especially of the hip hop short-film-within-the-film and the street documentary footage, comes from a freestyle approach to filmmaking itself – unscripted, off-the-cuff, real responses to contrived contexts played out in real time and jumpcut together coalescing into a finished feature film before your very eyes. The Filmfakers are shooting a ‘ghetto’ interpretation of the ancient Greek play, Lysistrata (“Sista Strada”) on the streets of LA. When approached by a group of street youths (the “Camjackers”), the Filmfakers think that they are being mugged so they give their camera, tripod and watch to the Camjackers and run away. The shocked Camjackers take the stuff and then discover the abandoned Filmfaker’s production van. The Camjackers decide to make a film in one day. They shoot some footage and then take the camera and laptop to their apartment to show their friends, Shante and Olinda. Rather than hock the stuff, Olinda insists that they make a film themselves. All four Camjackers ride in the stolen production van and work on their film ideas. Cody and Phoenix then play with the camera and accidentally leave it running. They film themselves and their world as we see rushes from their short film-in-the-making. We then see part of their edited short film. The cops see the Camjackers walking along the street and assume they stole the Filmfakers’ stuff. The cops give chase but the Camjackers escape. The Camjackers go to a club to find talent for their short film. They continue shooting street people into the night. While the Camjackers are shooting the last shot of the night, they are again harassed by the cops and then break free. Surveillance footage shows the Filmfakers recovering their equipment and checking their tapes and harddrives. The Filmfakers discover a short film on their harddrive (shot and cut by the Camjackers). The Filmfakers decide to steal the Camjackers’ short film and release it under their own names. The Filmfakers win the Best Short Subject Prize for their film. They begin their rise to fame and fortune. Several months later, the Camjackers see themselves and their film on TV without credit. They become very angry and plot revenge. The Camjackers break into the Filmfakers’ rich home, grab the original copy of their short film and steal some home movies and surveillance tapes. On these tapes we see the Filmfakers indulge in degrading and unethical behavior. We then see a cable TV entertainment show (“Real Entertainment”) that showcases the Filmfakers and their stolen short film. The Camjackers know they need releases to use the embarassing Filmfakers’ footage, so they pose as a “Pirategram” singer and a postal worker to get the Filmfaker’s to sign (hidden) release forms. The Camjackers then sell the raw footage to a sleazy cable TV entertainment magazine show (“Shamefile”). We see the trashy “Shamefile” TV spot assassinating the Filmfakers as professionals and human beings with samples from the Filmmakers’ own home movies and surveillance tapes. The Camjackers are officially recognised as authors of their own work and gain some fame for their efforts. As the final celebratory scenes unfold in the limo and the club (Project Blowed), we see the Camjackers living high. The Filmfakers, recently released from jail, visit the club. As the Filmfakers try to salvage whatever they can, we see Phoenix harshly dismissing the Filmfakers, who are then thrown out of the club. As the credits roll, we learn that the Camjackers actually put together the whole Camjackers feature film themselves. Latest Project Mooncircle Compilation out on iTunes worldwide!